Check out my step-by-step instructions for this recipe (with lots of pictures) on Instructables.com. The weather was so beautiful here on Saturday: bright sunny skies, warm weather (80-degrees in APRIL! ), trees and flowers blooming, so we had our neighbors, Chris & Shelly, over for a little barbecue. How could we not grill up some ribs? Mmm … ribs. These guys are sweet and tangy, with Oyster and soy sauces in the glaze helped along by fresh garlic, ginger, and scallions. Everything is enhanced by the grill — flame-broiled goodness! When ready to cook, preheat your grill to high. Check the heat using the “Mississippi test” — hold your hand about three inches above the grill grate; when the fire is at the right heat, you should only be able to count two or three Mississippis before you have to pull your hand away. Oil the grill grate (use long tongs to hold an oil-dipped cloth) and place ribs on grill. Cook until the ribs are done to your preference (about 3 to 4 minutes per side for medium) and nicely browned. Your ribs could cook more quickly, or take more time. So KEEP AN EYE ON THEM, especially if you’re using the boneless variety of short ribs. 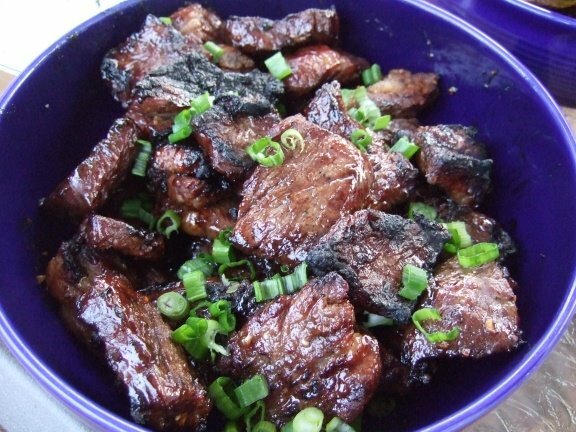 When ready, move ribs from the grill to a bowl, platter or plates, sprinkle the scallion greens, serve and enjoy!